In boating, fishing, hunting, and bowfishing, we use many different apps for river and lake navigation. I depended my iPhone’s map system for many years for this type of navigation until I discovered Stream Map USA. From the minute I downloaded this app, I was impressed. 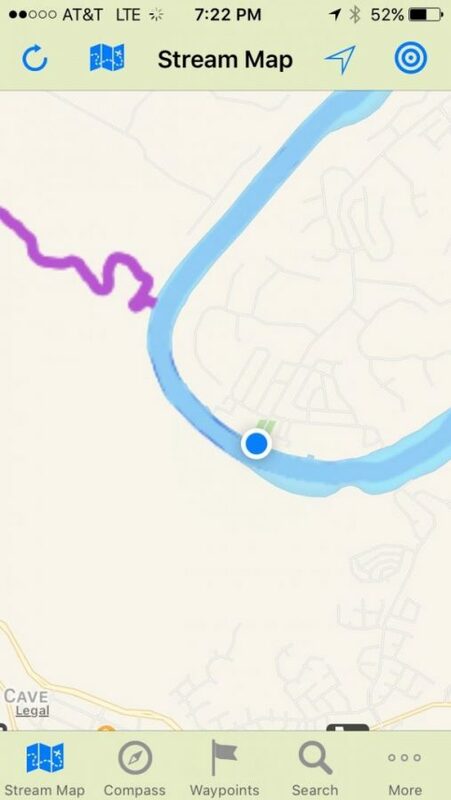 While most mobile map apps have always noted streams as blue lines, exploring streams was more difficult as it was hard to identify streams flowing into rivers or lakes and even more difficult to follow a stream’s flow. Stream Map USA has changed that for the better. Not only are the streams denoted in different colors on this app, you can also follow any stream from its headwaters to its mouth. This was especially helpful for me as I navigated lakes for bowfishing. On Lake Austin, for instance, we were finding grass carp hanging out in creeks flowing into the main lake. Stream Map helped both myself and my bowfishing guide navigate where the streams were and the length of these streams as they related to the lake. The app functions much like any other map app. You can mark waypoints and later navigate to those waypoints through a built in compass and navigation system. The compass shows you your target bearing and distance and you can also see your current GPS coordinates, altitude, speed, and heading. Using your phone’s built in map app or other mapping apps, Stream Map USA can even bring you from where you are on land to a given waypoint on the water and you can even e-mail someone your GPS coordinates to a given waypoint! How cool! As with other apps you have real time navigation capabilities with either satellite terrain or regular map imagery. 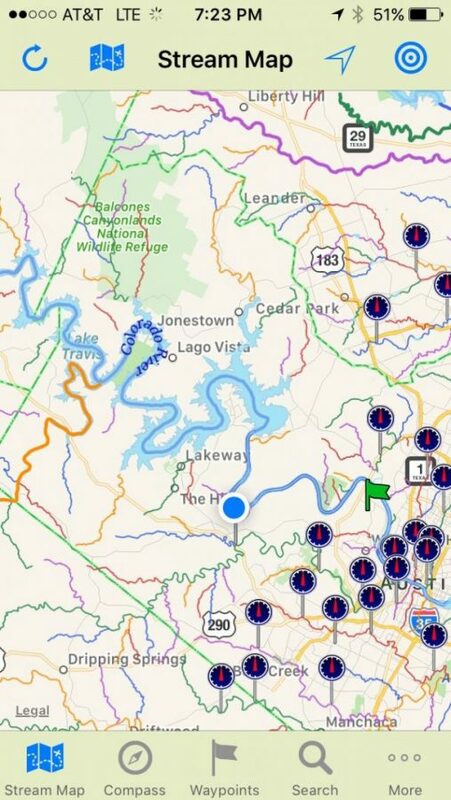 The satellite terrain feature on this app was especially helpful on a recent jug fishing trip on Lake Buchanan, a large central Texas lake, as it showed terrain features related to streams flowing into the lake that no other app had shown me before. For catfish and other species of fish, fishing the mouths of creeks can be a great ambush point for catching the big fish and this app helps find great fishing spots you may have never thought of before on your favorite river or lake. The color coding of the creeks on this app is especially ground breaking. Take a given lake or river or lake, regardless of size, and virtually every stream of water flowing into our out of that body of water is outlined in a different color, noting every feature of that stream of water. With all this and much more, this app offers up a huge selection of features that must be experienced to truly be appreciated. The good news though is that this app is only $8.99 and its available for download for both iPhone and Android phones and tablets. The best feature for apps like these, in my opinion at least, is that you pay for the app once and use it time and time again, taking advantage of any updates as they come out in the future. I think we are in the “Golden Age” of technology with apps like these for the outdoors. Thank you so much for reading and good luck out there on the water!